to continue the reconciling work of Christ in our times. 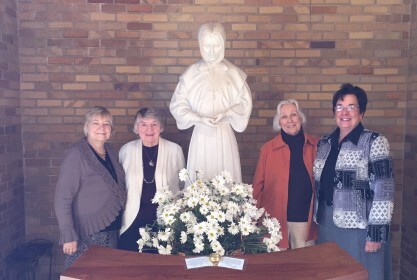 The Grey Nun Associates from the North Country, that is, Ogdensburg and Potsdam also renewed their Commitment. Their renewal took place at Mass on October 16, the feast of St. Marguerite. This was followed by a covered dish supper. Associates recognize that their call to relationship with God, self and others is rooted in their baptismal consecration. Through reflection, faith journey and sharing, the Spirit renews their call to discipleship and universal holiness. They are prompted by the charism of Marguerite d’Youville to share prayer, community and service, and thus reflect her vision of loving service of Jesus in the poor. Our Associates live their commitment to the Congregation in their daily lives and through partnering with the Sisters in various ways. Recently many of the Newtown and Yardley Associates were companions to our Sisters who moved to Redeemer Lafayette. Their services were invaluable, not only to the sisters they companioned, but to the moving process itself. Our Associates have also been partners in our Advent Evenings of Retreat, our recent Sock Drive and other prayer and service activities of the GNSH.